Unit Leader News is launching this week. We are pleased to announce that Unit Leaders throughout Montana will begin receiving Unit Leader News monthly. This informative newsletter will keep units up to date with happenings and critical information to aide unit success. We hope that this information is timely and provides tools that help Unit Leaders jobs become easier. 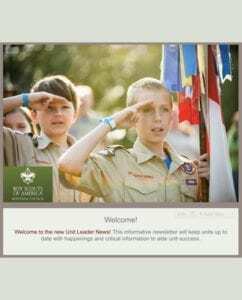 It is the goal of the Montana Council to work with Unit Leaders on the delivery of the Scouting Program and your vision as a leader. Give us feedback, continue to provide details on what is working and what is not and we promise to build you the best possible information source we can. Happy Holidays and Good Scouting!